LOYALLOOK's core philosophy is the manufacture and sale of a modern,fashion, versatile,and affordable jewelry collection. LOYALLOOK's aim is to provide the suitable jewelry for our customer which can be wear at anytime ,anywhere. Shield of Faith pendant size: 1.2"*1"
What makes this Shield of Faith Necklace better? *High polished shiny silver finish,never fade or tarnish,never turn your skin green. 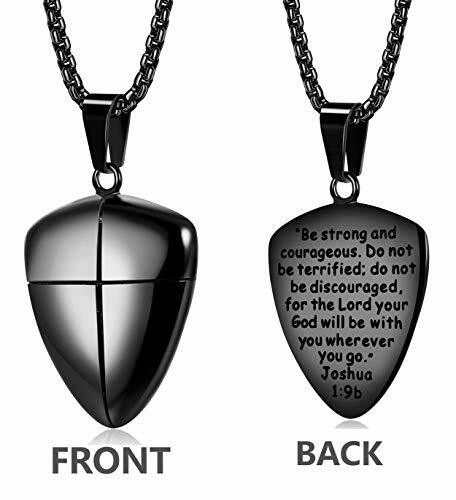 *Special shield pendant with cross design engrave on teh front,and Joshua 1:9b engrave on the backside. *Perfect daily jewelry,or great gift for your family,lover. 1.1st principle:Customer first. Contact us if you have any questions.We will get back to you in 24 hours.Don't hesitate to contact! 2.100% new condition and 100% sterner inspection.Don't hesitate to try! 3.90-Day Money Back Guarantee or Exchange.Don't hesitate to buy!